“I started out with bully prevention, I saw the need in the late-90s kids were missing consequences and courtesy was disappearing,” Ciarlante said. His program has reached more than 2 million children nationwide and has now grown to include 15 subjects, like animal safety, recycling and reading. 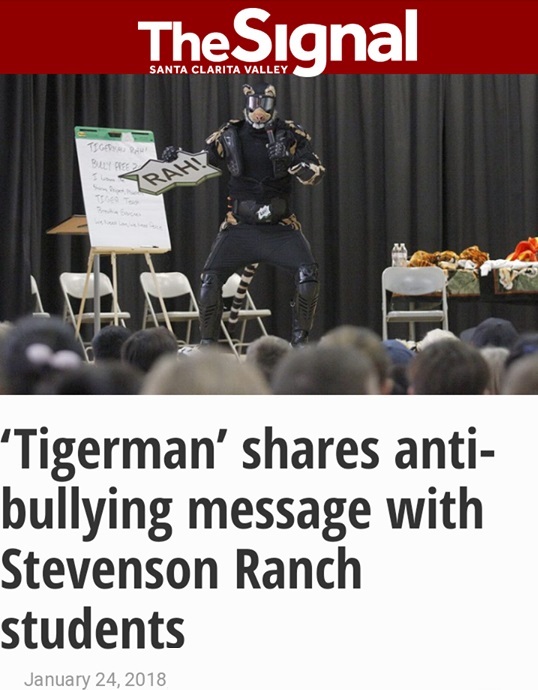 At Stevenson Ranch Elementary, the program included lessons on bullying prevention, manners, sharing, respect and relaxation techniques. “It would be amazing for them to have a clearer understanding of what bullying is and have life skills to address it,” fifth grade teacher Gail Orsinelli said. TIGERMAN® receives Certificate of Achievement Award from UNITY Foundation at Boys & Girls Club of America. Present for ceremony was Deniece Williams an American singer, songwriter and producer.